↑ "Michael Jackson's death was a homicide, coroner rules" (Press release). CNN. August 28, 2009. Retrieved August 8, 2016. ↑ County of Los Angeles Department of Health Services (2009). Michael Jackson death certificate. ↑ Huey, Steve. "Michael Jackson – Artist Biography". AllMusic. All Media Network. Retrieved May 31, 2015. ↑ Lewis Jones, 2005, p. 3 : "He wears the crown as the King Of Pop because no artist has broken his record of selling nearly 60 million copies of a single Album (Thriller)". ↑ Arar, Yardena (February 29, 1984). 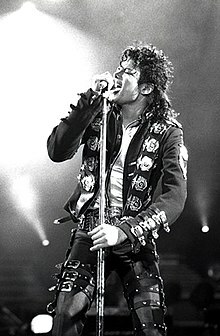 "Michael Jackson coronated latest king of rock 'n' roll". Boca Raton News. p. 7A. ↑ "Is the thrill gone for singer Michael Jackson?". Sacramento Bee. July 27, 1987. p. B3. ↑ Fernandes, Kasmin (June 25, 2014). "Why Michael Jackson was a style icon". The Times of India. Retrieved March 11, 2016. ↑ Lemon, Don (June 23, 2010). "Michael Jackson's style influence lives on" (Press release). CNN. Retrieved March 11, 2016. ↑ Vena, Jocelyn (June 26, 2009). "Michael Jackson's Style Legacy, From Military Jackets To One Glove". MTV. Retrieved March 11, 2016.